1. This map only contains the excavation work in Cemetery 3 and a part of Cemetery 1, which was done in the first season of 1963 and later continued in the second season of 1963 - 1964. 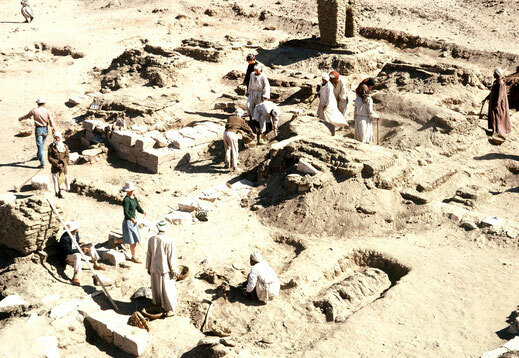 The excavation was then extended in 1964 - 1965 to the northern part of Cemetery 3. The work of that season is not included on this map. If more remains of other 'pyramids' were found in that area, I can not say. 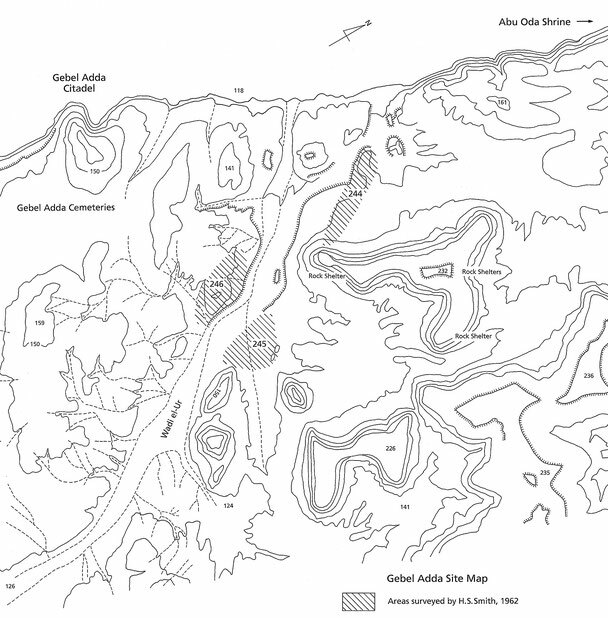 The legend shown in the left corner of the map describes the material used for the 'pyramids': 1 - 5 stone structures and 6 - 19 mud-brick structures. This drawing, partly incomplete, is based on an old survey map made by Peter Mayer and Horst Jaritz. The tombs found in the later seasons of 1964-1965 and 1965-1966 are here not recorded. Nicholas B.Millet writes: "Some two or three feet of sand overlay the face of the Gebel at this point, and it was some days before clearance had proceeded to such a point that the nature of the cemetery could be understood.The ground, which here consisted of dense earth more nearly yellow in color than the Gebel of Cemetery 1, proved to be honeycombed with tombs of several different periods, lying close upon and in many cases cut into each other. 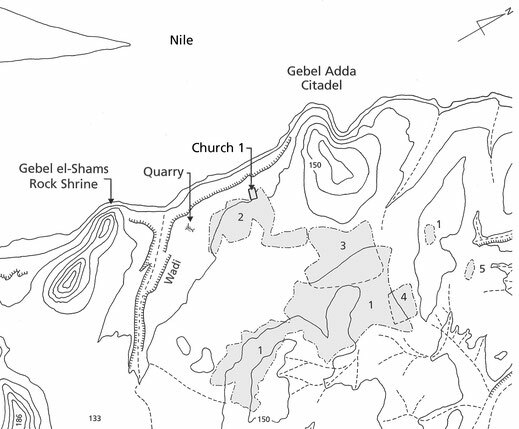 The closeness of the area to the Citadel apparently resulted in more or less continuous use throughout the time that Gebel Adda was occupied". 2. This photograph was taken in the last season from the top of the Citadel hill looking northeast and shows the northern continuation of Cemetery 3. Middle of the photograph and to the left, between the two telephone poles and some distance behind Cemetery 3, Cemetery 4 was located. If this Cemetery was only an extension of Cemetery 3 or of an earlier date, can not be said, since the documents of this site are not available. This is the only photograph I can present, which shows the location of Cemetery 4. In the region behind Cemetery 4 the remains of a few tumuli of the C-Group period were noted. Towards the end of the fourth Season of 1965 - 1966 the water level of the Nile rose rapidly and at this time the Wadi el-Ur, shown at the back of the photograph, was already flooded. On the northern side of the Wadi el-Ur was the high ridge with the caves, which Harry Smith mentioned in his report. See map bellow. ( photo by Kent R. Weeks ). 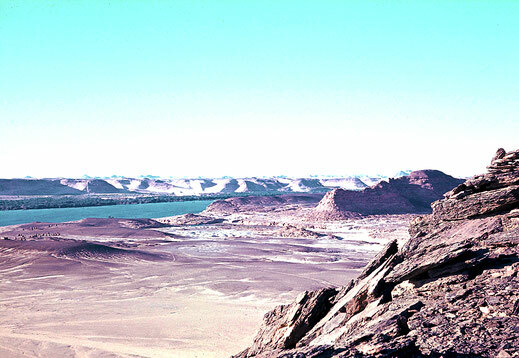 During The Nubian survey in 1962, Harry S. Smith also had visited the site of Gebel Adda and published his observations in the "Preliminary Report of the Egypt Exploration Society's Nubian Survey". He describes in his paper especially the north and south side of the Wady el-Ur, which was the northern border of our Gebel Adda concession. 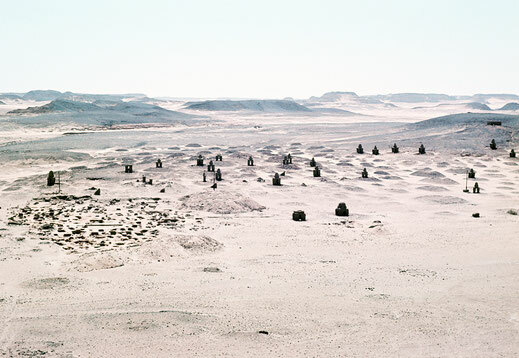 Cemetery 246: "On the east and south sides of a hill on the west of Wady el-Ur , behind the fortified hill-town of Medinet 'Adda, is a large group of roughly circular stone tumuli, perhaps 40 - 50 in all. These tumuli were simply cairns of rough stones pilled up against the hillside without courses of mortar, and they had no offering pottery associated with them. Five tombs were dug. 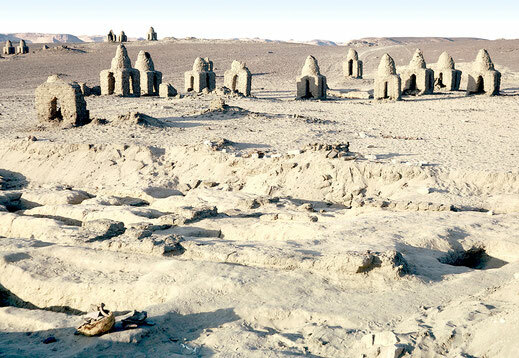 It seems evident that this site was one of the poorer inhabitants of Medinet Adda during the X-Group period". In Cemetery Nr. 244 he describes four C-Group tumuli, which had been completely plundered. Here the stone lined grave chambers where built on top of the hard sandstone bedrock, and not cut into the soft mud gravel. The other Cemetery Nr. 245, located further south, was also of the C-Group period. In the northern part it had 16 tumuli while at the southern end about 12 tumuli were noted, of which all tombs were badly plundered. He also mentions in his paper the rock shelters as follows: ( On top of a desert peak north of Cemetery 245 are 29 rock shelters with which are associated sherds of a late ( Meroitic X-Group type ). At the foot of the same hill were a number of caves and shelters, near which were found some late sherds and others possible of C-Group date. These may well come from nearby cemeteries ). 3. The shaded areas shown on the map indicates the sites described by Harry Smith. 4. Sketch of the desert peak by Richard Edlund. 5. 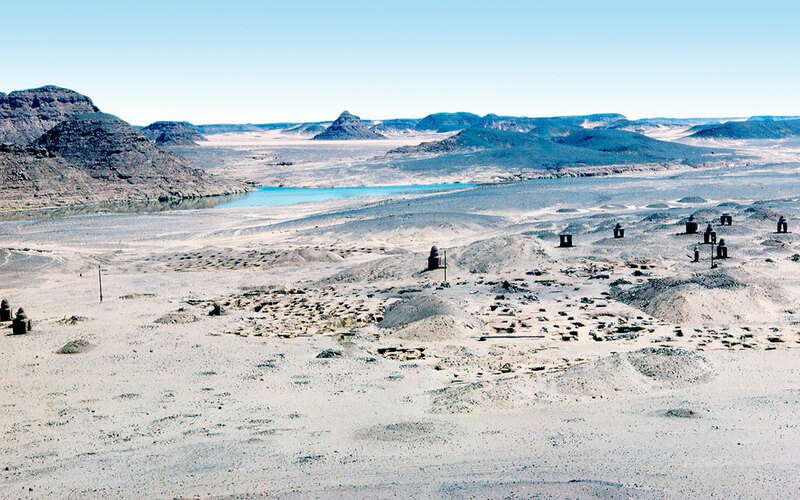 The right side shows the Wadi el-Ur and beyond the desert peak with the rock shelters mentioned by Harry S . Smith and Richard Edlund. Our expedition member Richard Edlund also visited the desert peak and had entered the man made opening at the southern flank of the ridge, which was high above the ground level. 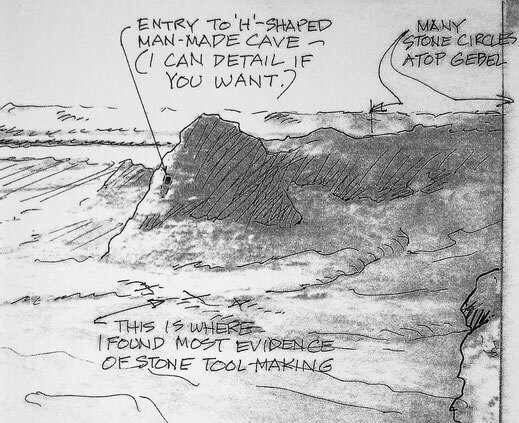 According to him two parallel man made caves, connected in the middle, led upwards in a northern direction and ended behind the peak on a lower crest, where he noted many stone circles. 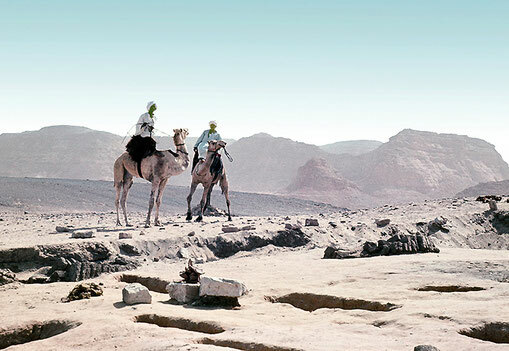 He also told me that he found on the plain a spot, located between the desert peak and the northern edge of the Wadi el-Ur, where he discovered a site of stone tool making. 3. Cemetery 1. Detail of southeastern corner of 'pyramid' 1 with mud-brick chapel and pedestal for the Offering-table. ( photo by Horst( Jaritz ). 5. Cemetery 3. Best preserved stone foundations pyramid / mastaba with distinctive stone tooling marks. 7. Cemetery 3. Large robber hole through the barrel shaped mud-brick vault of 'pyramid' 2. Here, as an exception, the inside walls of the tomb where painted white. 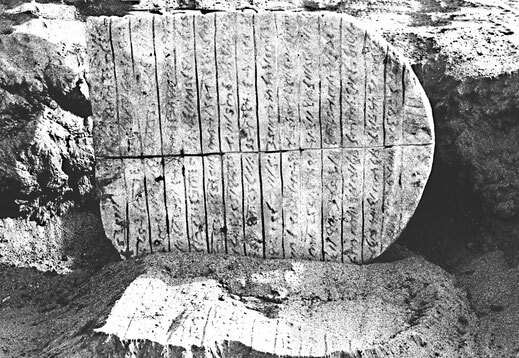 Cut in the Gebel around the tomb where several graves of later dates ( photo by Horst Jaritz ). 9. Cemetery 3. Looking northeast with removed stone blocks of a 'pyramid'. Background with Camel police. 11. Cemetery 3. Looking north west with the remains of a 'pyramid'. Background with Ottoman superstructures. ( photo by Horst Jaritz ). 13. 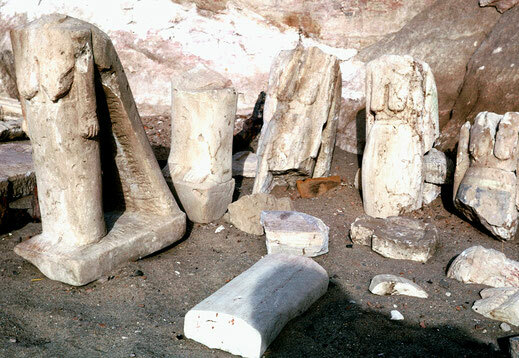 Ba-statues and statue fragments from Cemetery 3 and 4. ( photo by Horst Jaritz ). Cemetery 3. Early X - Group Period. ( photo by Richard Edlund ). 2. Cemetery 3. 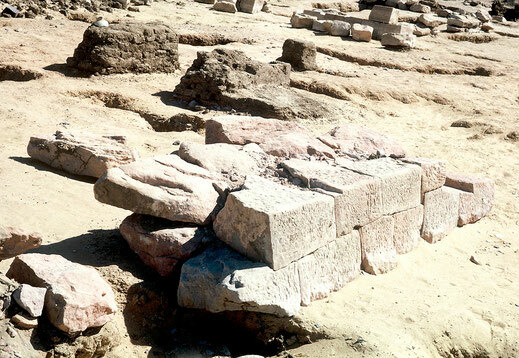 Stone foundation of 'pyramid' 1 with the remains of the mud-brick chapel and pedestal for the Offering-table. 6. Cemetery 3. Stone foundation of 'pyramid' 1 with the remains of the mud-brick chapel. Background: tumuli field of Cemetery 1 and Ottoman tombs. 8. Cemetery 3. Excavation underway in early 1964 in the area of stone 'pyramids' looking north east. 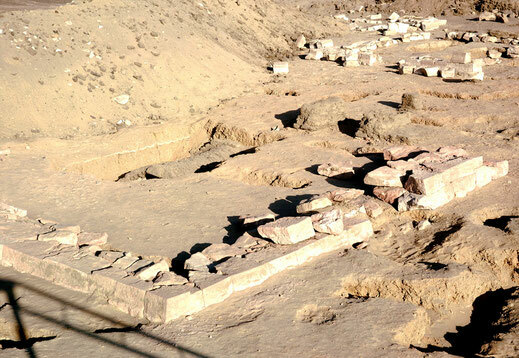 To the left are the remains of a Rectangular mud-brick superstructure. Background with Ottoman superstructure. 10. Of this mud-brick 'pyramid' up to nine courses of bricklayers had survived. It is not clear, if that mud-brick structure belonged to Cemetery 3 or 4. 12. 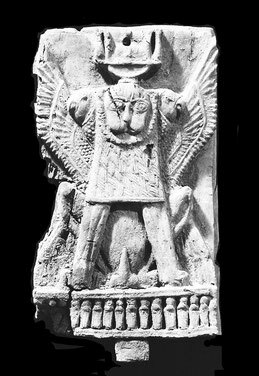 Stray find: Meroitic stela GA 19 found at the western limit of Cemetery 3. 14. Cemetery 3. Offering table found in front of 'pyramid' 1. 16. 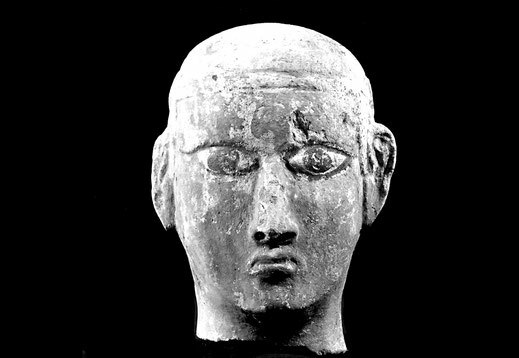 Head of a Meroitic Ba statue. ( photo by Horst Jaritz ). mud-brick tomb. For the space of the lower extremities the alluvial material was tunneled out. 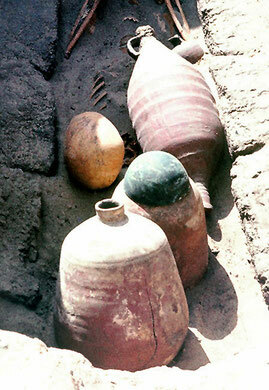 With two jars, copper-alloy bowl, amphora and oil bottle in situ. 3. Tomb No. 534: Barrel shaped mud-brick tomb of the early X-Group period. The so called 'blacksmith' was buried with hammer, tongs, trimming file and jars. 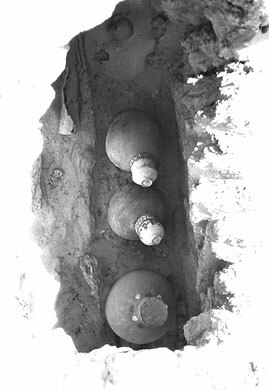 Behind the mud-bricks of the blocking three goblets were placed. 8. 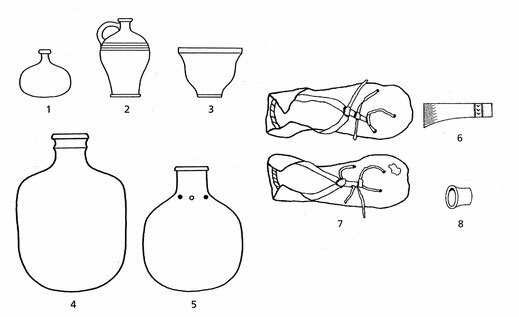 Drawing of Tomb No. 726 in Cemetery 3. 2. 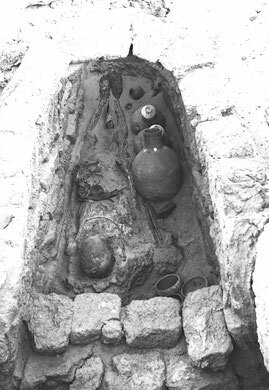 Same Tomb: Enlargement of the grave goods. Photo taken from the entrance. 6. X-Group infant burial on in a shallow grave with bead necklace and earrings. Behind the head with goblet and small jar. 9. 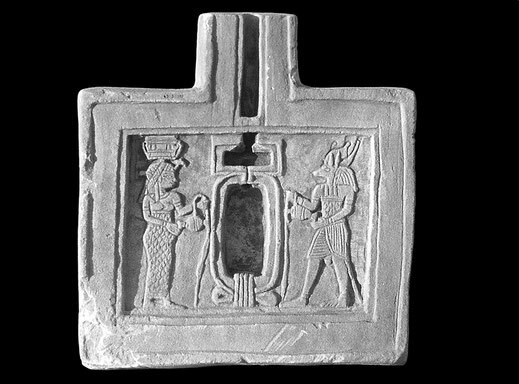 Grave goods from Tomb 726. Description by David N. Edwards in "Sudan & Nubia", Bulletin No. 16, 2012, page 80 - 87. 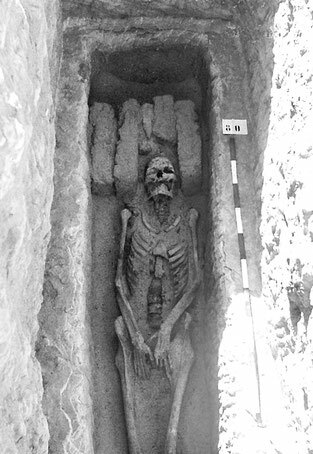 "As at Arminna West, some unusual grave forms also appear amongst these post-Meroitic burials. One of those was Tomb 726; with a completely atypical shape and with its unusually large dimension, it may have been the largest tomb in Cemetery 3. No superstructure survived but on the surface was traced the outline of a low oval platform measuring ca. 7,5 x 4,7 m defined by a crudely excavated cut to a depth of 200-300 mm. 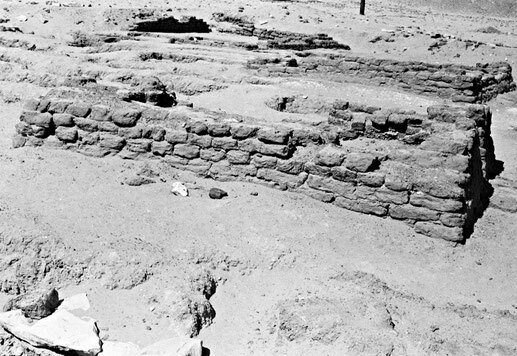 This perhaps suggest the original presence of a tumulus structure (since eroded), constructed of material quarried around it. On the east side of this platform a sandstone offering-table was found, apparently in situ. In the centre of the platform a large rectangular shaft was cut to a depth of 1,2 m. At the north-west edge a further shaft gave access to the burial. Unusually it was placed in an excavated chamber rather than in a pit with a mud-brick vaulted roof. Of the blocking only five layers of unusually large mud-bricks, size 350 x 200 x 100 mm., covered on the outside with mud plaster, were still in situ, the upper part had been removed by the plunderers". The large Christian Cemetery 2 curled around the south-eastern slope of the Citadel and continued towards the southern part of the plain. 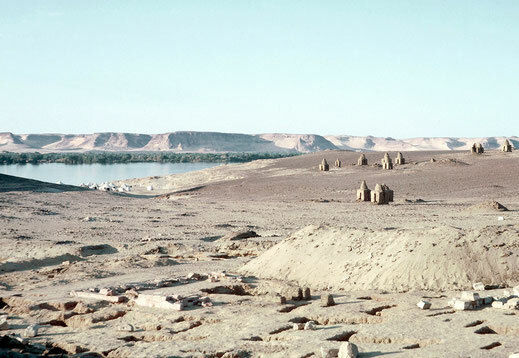 Here the tombs were cut out of the Nubian sandstone plateau in the direction east-west. 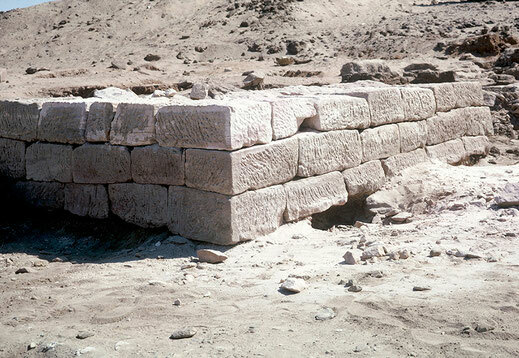 Several tombs were covered with a low rectangular mud-brick mastaba and at the western end some had a small niche which still contained an oil lamp. On a few mastabas traces of a white coating were found. The Christian Church 1 was located at the north-western part of Cemetery 2. In center of the photograph it shows the nave and apse oriented east - west. On the right side of the pillar supports the aisle and the remains of the southern wall are shown. Several rectangular graves of various sizes were dug out of the sandstone floor of the Church. Of the original pavement floor only a small area was found. Photo with Robert Hupton in the apse. Background of Church 1 with Christian Cemetery and tumuli field of Cemetery 1. It is unfortunate that I can not provide more photographic material of this interesting Church. 2. Remains of the original sandstone pavement floor in Church 1. 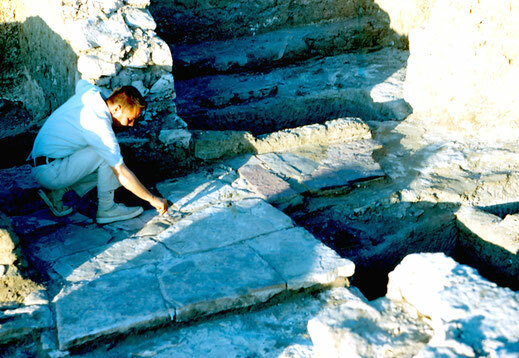 Robert Hupton inspecting the stones. ( photo by Kent R. Weeks ). 3. 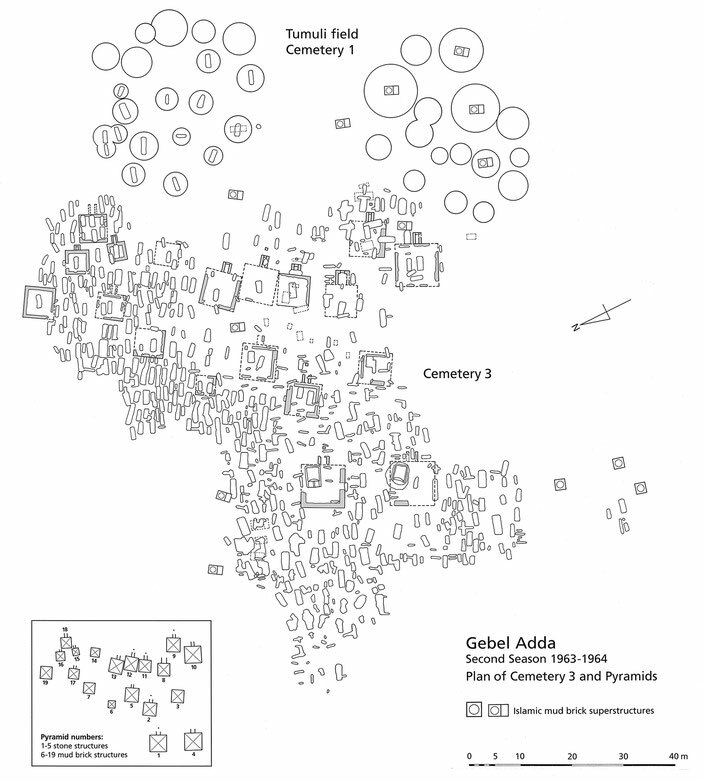 At the rigth side: Map of Gebel Adda with location of Church 1, Quarry, Citadel and the Cemeteries 1 - 5. Of Cemetery 5 I have no information. 1. Panorama of the "Cemetery Hill" showing the southern part of the late X-Group tumuli field with the position of Tumulus 151. 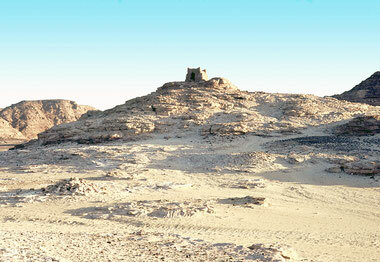 Here, most of the Double domed mud-brick structures of the Ottoman period were built above of a tumulus. The few early Christian graves found in the small Cemetery are marked with a cross. 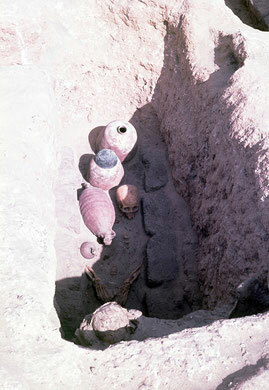 All the Christian burials were extended burials, oriented east-west, with the head to the east. 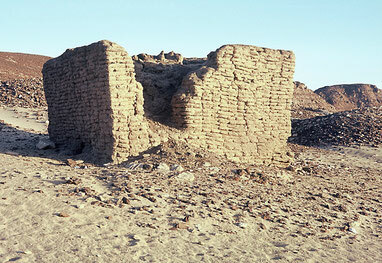 The rectangular mud-brick walls, Nr. 1 and Nr. 2, apparently tombs of a more recent date, were not investigated. Tomb Nr. 3: On top of the ridge shown at the right side of the photograph, was a well preserved rectangular mud-brick tomb with a vaulted roof and arched doorway. If this well built built tomb was ever examined, I can not say. Apparently it was also of a more recent date. 2. Panorama: Continuation of the above photograph in the direction towards north-west. In the foreground a Wadi ran along the northern flank of Gebel el-Shams. Near the Wadi's mouth was tomb Nr. 4 with rectangular mud-brick walls, apparently of a more recent date. Background with River Nile, Dahabiya "Osiris" and the Citadel. Besides the typical Double domed tombs of the Ottoman period that were spread around the site, there was another type with only one Dome. 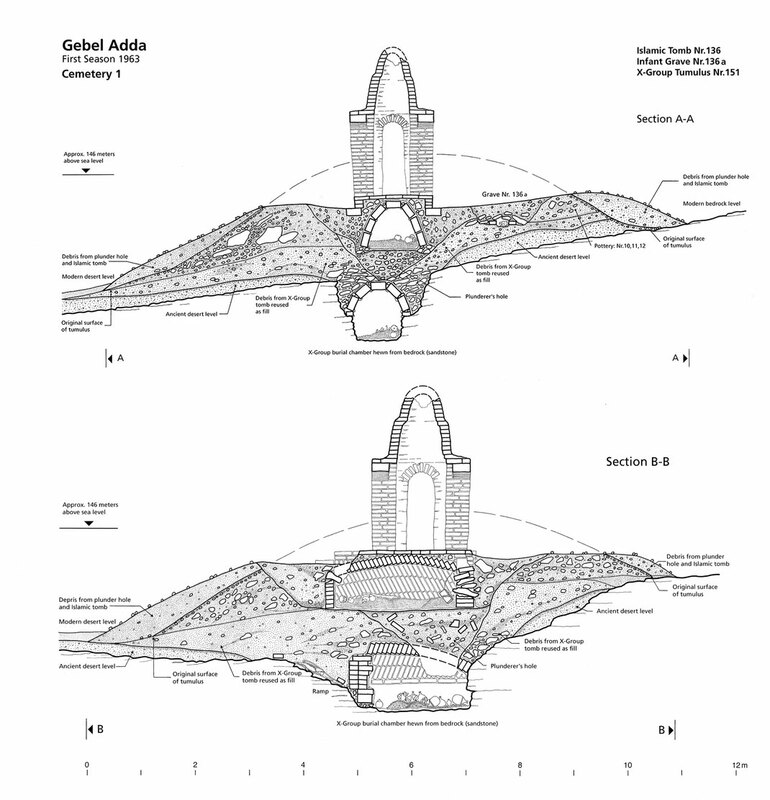 Letter A: Shows a group of three single Domed tomb types, of which only one still had a Dome. For more information see photographs under the title Tombs: "Domed Ottoman Tombs". 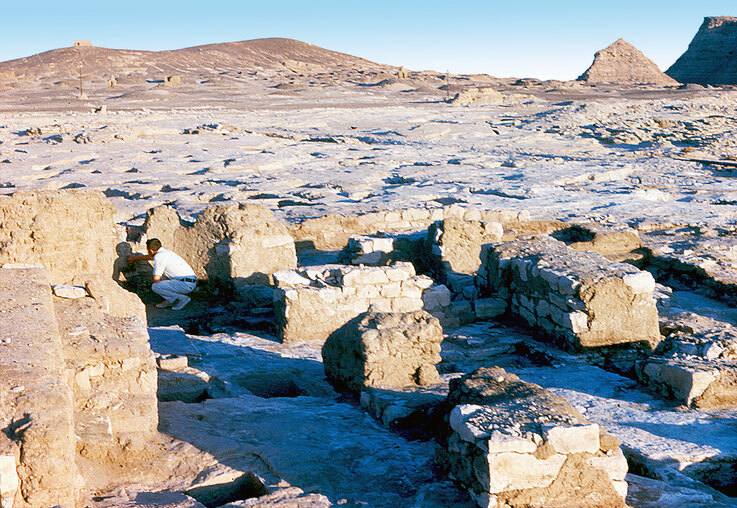 Remains of an rectangular mud-brick structure. Northwestern side with traces of an entrance. Possibly of a more recent date. southwest. With arched entrance at the northeastern end. Possibly of a more recent date. 1. 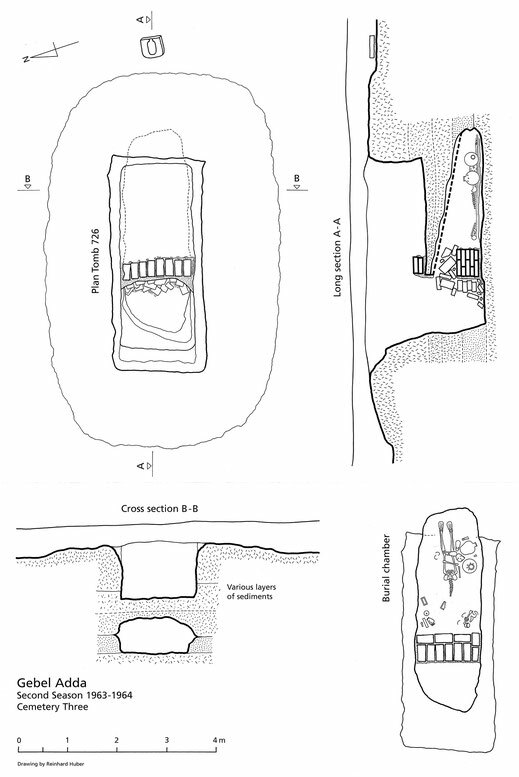 Cemetery 1: Sections A-A and B-B through the Double domed mud-brick superstructure and the late X-group Tumulus 151. 2. 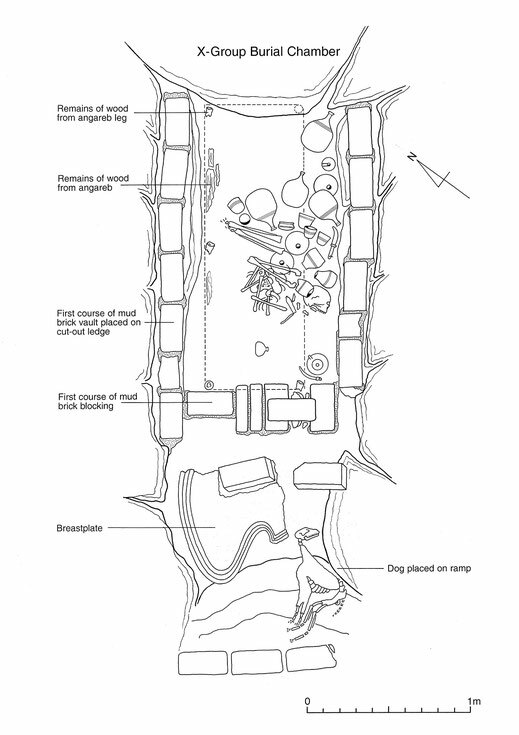 Drawing of the burial chamber in X-Group tumulus 151. In 1959, the University of Alexandria, under Dr. Mustafa el Amir and his team, also had tested seven tumuli at the southern end of Cemetery 1. In the first season of 1963 we started working in the same area and excavated most of the tumuli in that region. 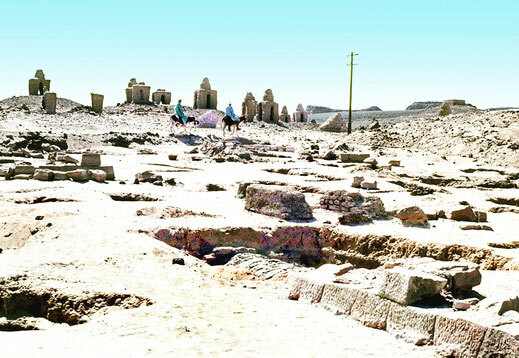 In several cases the Ottoman superstructures atop the tumuli had to be removed to gain access to the burial chambers bellow. Of all the tombs found in that region, Tumulus 151 proved to be the most interesting one and as an exception, it was carefully excavated quarter by quarter. As it turned out, this time consuming method justified the results we gained. 3. 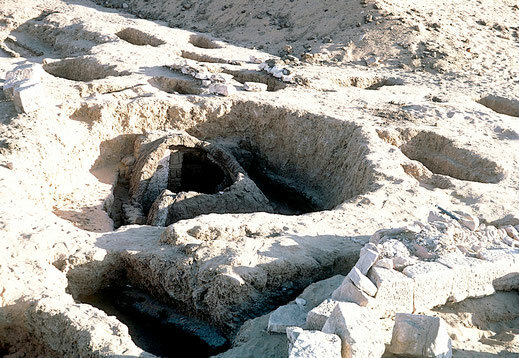 Burial chamber in X-Group Tumulus 151. Photograph taken from the rear end of the Tomb. The rectangular burial chamber, crudely cut out of the bedrock, had a length of ca. 1.9 m. On its side walls ledges were hewn out to support the barrel shaped mud-brick vault. In front of the undisturbed blocking a short ramp, cut out of the bed-rock, went up to the natural surface. 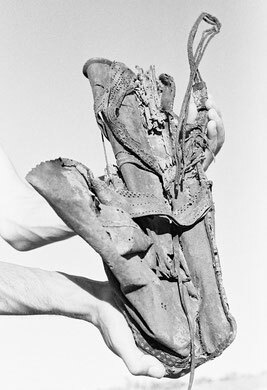 Placed on the ramp were the remains of a breast-plate, made of leather, and a dog. The inside of the burial chamber was completely dis-turbed by the plunderers. 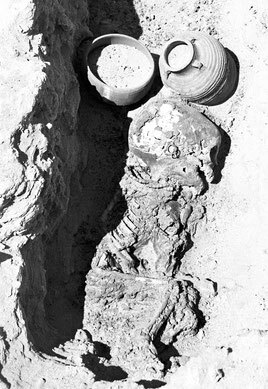 On the left side traces of wood and legs of an "angareb" were found, on which the body had been placed. 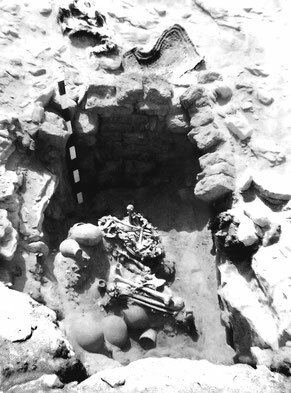 The tomb contained a variety of interesting grave goods of the late X-group period. ( copied from an old polaroid photograph taken by Richard Edlund ). excavated in the small graveyard at the southern end of Cemetery 1. 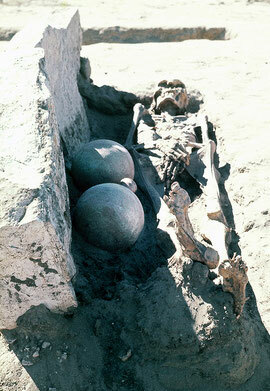 In the southern area among the late X-Group tumuli field, was a small graveyard of the early Christian period. Some graves were cut out of the bedrock with ledges along the sides to support the sandstone slaps which covered the extended body, while a few others were dug out of the softer alluvial deposit. Only a few tombs of this Cemetery had narrow, tunneled, side chambers. All bodies were placed on their back, facing up, oriented east.